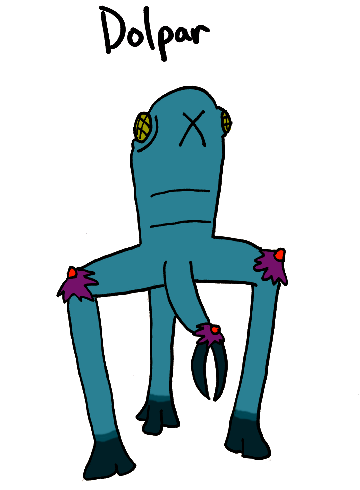 The Kringdaru are a three-legged species that have a single dexterous claw. They are large compared to humanity, standing about two metres on average, but there are many species that are much larger on their homeworld. The Kringdaru were, in their history, frequently preyed upon by a number of large carnivores, but their greater intelligence allowed the Horhutans to rise to the top and create their society in relative safety with their fancy technology. One of the Kringdaru, with super powers beyond those that are typical of the species, has somehow gone off to the planet Earth to fight superheroes there while taking the name Invay Dor. It does not seem that Invay Dor’s desire to invade other planets is typical of the species, though. Dolpar is a breeder, whose life is devoted toward egg-laying. Breeders live in the center sections of Kringdaru cities, and are cared for by servants. Given that their lives are devoted to the sole task of laying eggs (they don’t even have to care for the young), the breeders are free to devote mental energy toward a game (we can compare it to chess, but it is fairly different). This game is the most popular sport of the planet. Dolpar does not rank among the best players in the world or anything, but is renowned enough to those who follow the game closely. 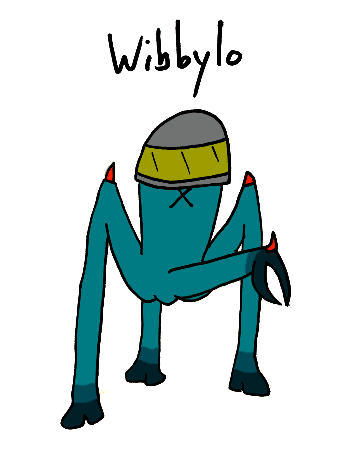 Wibbylo is a water capturer. The Kringdaru devote great amounts of resources to taking water from natural sources, like rivers and springs, loading it into containers, and bringing it back to their cities for use. If there is a reason they don’t just use water straight from the sources, or even use pipes or something, it is not a reason that we as humans can understand. 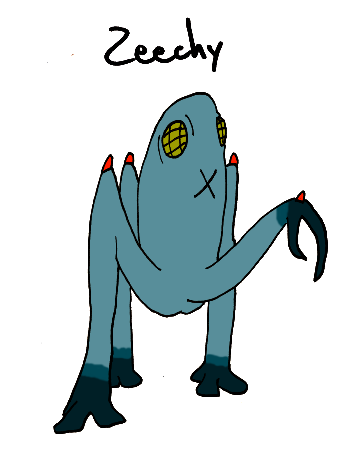 Zeechy is a nice young Kringdaru who enjoys spending time with friends, quiet nights, and long walks. Dislikes include excessively hot temperatures and comets. Zeechy collects rocks that have been shaped into spherical shapes and regularly volunteers for work at the crematorium where dead Kringdaru are burned and their ashes gathered for various industrial uses. A Fact About Kringdaru: The Kringdaru are able to mimic the sounds made by other species of animal on their world with much accuracy. When they train an animal for some use, they are more likely to do it by almost speaking that animal’s species than to try to make the animal understand their own. Tagged: aliens, character sketch, Super Sunday!